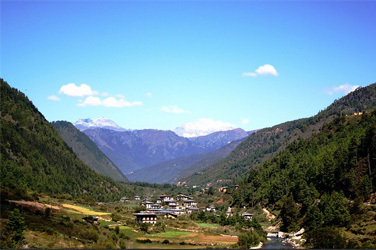 Haa Valley trekking is situated in the north-west of Bhutan bordering Tibet. It was closed to tourism until 2001. The following ancient trek route will take you through some of the most scenic views of Ha and Paro valleys over alpine Kalila pass, as well as to Paro, Thimphu and Wangdue phodrang for cultural touring of medieval dzongs, temples and monasteries. Morning visit weekend market absolutely central to the lives of the Bhutanese, Hand Made Paper Factory established in November 1990 as an undertaking of the Royal Government of Bhutan, and Memorial Chorten this is particular chorten was constructed in 1974 as a memorial for the third King of the country, King Jigme Dorji Wangchuck, who is wiy regarded as the father of modern Bhutan and evening relax and stroll around the city. Overnight Thimphu Hotel.